Systemic treatment of WG consists of a combination of glucocorticoids (GC) and a cyto-toxic agent. For life- or major organ-threatening disease, daily cyclophosphamide (CYC) therapy is used (7). After three to six months, when disease remission or significant improvement is achieved, CYC is discontinued to avoid the significant morbidity associated with prolonged exposure to this agent. A less toxic agent such as methotrexate (MTX) (15) or azathioprine (AZA) (16) is used to try to sustain remission. For patients with milder forms of disease, MTX has been useful as initial and maintenance therapy (17). The optimal period of maintenance therapy has not yet been determined in randomized, controlled studies. The decision of how long to treat with cytotoxic agents must be individualized. After one month of treatment with GC (prednisone 1 mg/kg/day), the dose is slowly decreased over a period of about six months until discontinuation, if that is possible without relapse. Some patients may require low doses of GC (e.g., prednisone 5-10mg/day) to maintain disease control. Local treatment for disease involving the head and neck region is often necessary. Empiric experience has led to recommendations to maximize upper airway hygiene to minimize obstruction from crusts and other debris, and diminish colonization with infectious agents. For patients with chronic persistent sinus symptoms, nasal irrigation may be required up to several times a day. Water picks with nasal adaptors, or customized irrigation systems, use 200 to 1000 cc of saline or sterile water for irrigation, repeated until the return becomes clear. Since chronic nasal carriage of Staphylococcus aureus is associated with a higher rate of disease relapse (18), reduction of nasal colonization by irrigation, with or without nasal topical antibiotics, is advocated by most authorities. An alternative to antibiotics is to use moisturizing agents that contain lubricants such as glycerylmonoleate. Either would be applied with cotton applicators within the outer one-third of the nasal vestibule and sniffed up toward the sinuses after irrigation to help reduce symptoms from dry mucosa. For some patients with severe destruction of the nasal structures, large crusts may have to be mechanically removed. Repeated courses of oral antibiotics are occasionally necessary for patients who experience frequent or continuous ENT infections. Surgery is usually reserved for refractory head and neck manifestations. In general, when there is a choice, it is best to consider surgery when disease is under control and GC doses are minimal. High doses of GC may pose a problem, considering the potential for this medication to impair wound healing. Unfortunately, in some patients, symptoms may be severe and surgery may be needed for prompt relief or diagnosis. Diagnosis in this case may refer to initial diagnosis of WG or to distinguishing WG from infection. Indeed, features of both can play a role in many patients. Sinus surgery is performed to restore drainage, either through the external or intranasal approach. Both endoscopic and external approaches have been utilized. The goals include removing diseased tissue, which is the source of pain; restoring more natural drainage; and in cases with uncertainty, obtaining tissue to aid in diagnosis (8). Repair of septal perforations is not recommended. Perforations alone are usually not the cause of significant symptoms. In addition, because it is difficult to distinguish low-grade active disease from the effects of chronic damage, there is risk that unnecessary surgery may produce an exaggerated inflammatory response, making matters worse (19). Saddle nose deformity is a therapeutic challenge. Many patients seek reconstruction surgery, but such procedures may have significant complications. The repair may be followed by graft resorption and even worse deformity than that originally noted. This appears to be more common in patients in whom WG was not in remission and for whom medications were not minimized at the time of surgery. In a small series (13 patients, 16 surgical procedures) from the Mayo Clinic, materials for nasal reconstruction associated with failures were irradiated homografts (rib and dura mater). Autologous materials such as calvarial bone and costal cartilage provided better results. All patients were in remission at the time of surgery. Neither local nor systemic perioperative disease relapses occurred. Median follow-up was 33 months (range 10-177 months). Disease severity was evaluated as it related to the success of the procedure. Patients with only ENT disease (8/13) had a success rate of 88% (7/8 primary reconstructions). In patients with ENT and lung involvement (5/13), the success rate was 60% (3/5 primary reconstructions). None of the patients had renal disease. It was suggested that disease severity may affect the chance for a successful outcome, but because of the small number of cases, no definitive conclusions can be made (20). Dacryocystorhinostomy for obstruction and/or recurrent infection in the lacrimal duct and sac can be performed using an external or endonasal approach. Major complications are infection and necrosis of the surgical repair area and formation of nasocutaneous fistula. As with surgery for saddle nose deformity, the likelihood of success is greater if the disease is in remission (21). 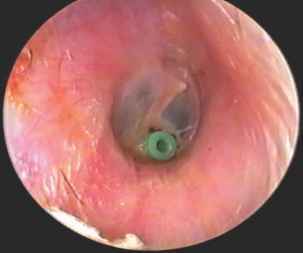 Most patients with recurrent or persistent serous otitis media resulting from Eustachian tube dysfunction can be helped by myringotomy with or without tympanostomy tube placement (Fig. 6) (22). Mastoidectomy is indicated for selected patients with severe refractory mastoid inflammation. Nearly all cholesteatomas require surgical excision (tympanoplasty with mastoi-dectomy). If left untreated, progressive destruction of the ear can occur. Combined subglottic dilatation and intralesional injection of depo-GC has been successfully employed and has resulted in marked reduction in the need for tracheotomies for SGS (23). The stenotic lesion is injected submucosally with methylprednisolone acetate or an equivalent depo-GC preparation. If necessary, longitudinal incisions are made to release the constricting stenotic ring. Progressive serial dilatations with Maloney bougies or a Fogarty catheter balloon are then performed. Some, although not all authorities, have also recommended topical applications of mitomycin-C to inhibit fibrosis and restenosis (24); however, the value of topical mitomycin-C has not been evaluated in controlled trials. In longitudinal experiences with this technique at the National Institutes of Health (25) and Cleveland Clinic (23), none of over 40 patients required a new tracheostomy and there were only three significant complications (pneumothoraces). There were no adverse long-term sequelae (23,25). Laser therapy for SGS should be avoided because of the high risk of producing severe laryngeal damage, more extensive scar formation, and consequent restenosis. Stents should be considered only as a last resort in WG. Metal stent placement for benign disease is frequently associated with airway complications including stent fracture, excessive granulation tissue, poor patient tolerance, inability to successfully place the prosthesis, and stent migration (26). In addition, inflammatory tissue from active WG may grow through the stent interstices, increasing the risk of restenosis (27). 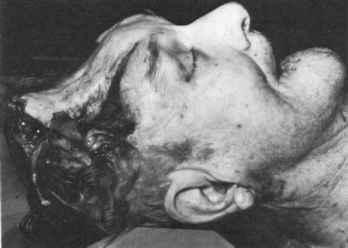 FIGURE 6 Wegener's granulomatosis: myringotomy with tympanostomy tube placement. Tube-free tracheostomy is a relatively new procedure for patients requiring permanent tracheostomy and has the advantages of preserving the patient's voice, cough mechanism, and normal swallowing (24). Laryngotracheal reconstruction with costal cartilage graft placement has been performed in selected patients. Attempted repair with this technique has allowed successful permanent tracheostomy tube decannulation without graft failure (28). Immunosuppressive medication is the main therapy for orbital disease. Rarely, orbital decompression may be necessary, if proptosis is severe enough to compromise the optic nerve. Unfortunately, this procedure is usually palliative at best; it does not guarantee sight preservation or pain relief.